Hi everyone, better late than never!!! Sorry I haven't put the cards on the blog until now but I am running behind as I've been quite busy, sorry!!! 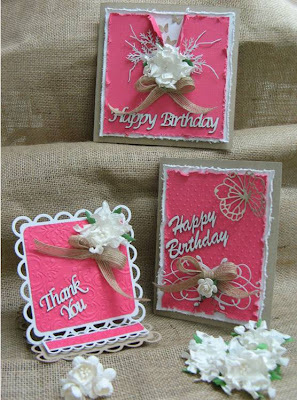 These are the cards that we will be doing in our August Card Classes. As you can see I have showcased some more of the NEW "Memory Box Dies". There are so many more available, but we can only use a few at a time unfortunately. We have another big order of these due in hopefully Friday, fingers crossed.